resources, resource, business resource, resource software, bookings, booking, booking agent, small business resource, small business resources, apputlook and Exchange server. Multiple calendars can be shown. Resource descriptions saved in public folders or shared mailboxes. Overview. Statistics tool. With Calendar Browser booking resources is as easy as making an appointment in the Outlook Calendar. 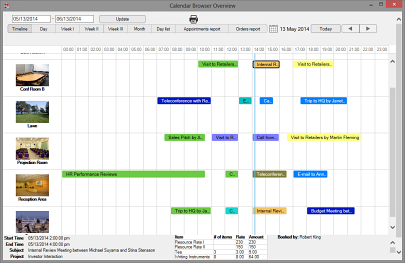 Calendar Browser adds lots of features to any Outlook Calendar. Book resources and supplies with Outlook and Exchange server. Multiple calendars can be shown. Mark an appointment with a mandatory project name or add booking of services (coffe, notepads etc) to the booking. All features highly customizable. Source code available for purchase for complete control. WYSIWYG .html editor for resource descriptions with pictures etc. Also URL possible. Overview. Statistics. Win8, Office 2010 and 2013, 32- and 64-bit. Free trial for 30 days without limitation on number of users/calendars etc. Admin and User manuals downloadable from kalmstrom.com. Online video tutorials and documentation available. Subscription $180/month for all kalmstrom.com products, unlimited number of users.